How would you like to travel the world living in rooms larger than the biggest suite in the most exuberant hotels? How would you like to experience vacations where you have the most private of balconies with the most stunning of views? How would you like total privacy and private facilities and separate rooms for each person in your company? Imagine finding some of the best locations in the world. Imagine sipping a glass of wine on your large private balcony with stunning views while seeing local wildlife at the far end of the garden. Imagine discovering locations and natural features of the environment that most have never suspected are there and are shared with very few. Imagine sampling temptingly delicious local foods, drinking sumptuous local wines and chatting with locals and discovering the real aspects of foreign shores. Imagine going off on a six month long vacation in the lap of luxury and it costing you little more than it would to live at home? Well, what I have discovered is that I can experience all of the above and more. I think I have discovered one of the best kept secrets ever. As a semi-retired baby boomer I wanted to travel, travel, travel while I still have my great good health and I can still enjoy it. 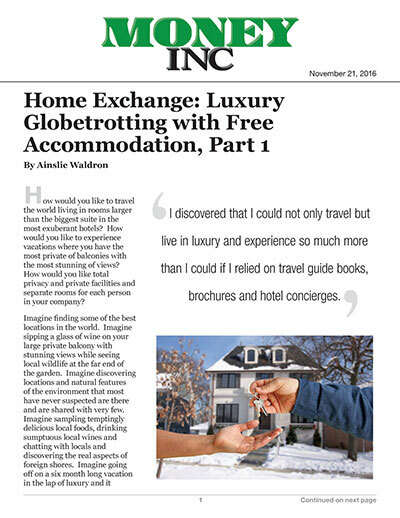 I discovered that I could not only travel but live in luxury and experience so much more than I could if I relied on travel guide books, brochures and hotel concierges. I can afford the luxury of taking as much time as I want to relax. No need to wear myself out cramming as much into my three-week vacation by ensuring that not a minute is “wasted” relaxing. Now I have discovered that I can have as many days “off” just relaxing by the pool or reading a book as I wish while still having time to explore surrounding areas to my heart’s content. I have discovered house exchanging and I have never looked back! I cannot sing the praises of house exchanges loudly enough. I reckon it’s one of the world’s best kept secrets. As someone who regularly traveled the world for both work and pleasure during my working full time years I was feeling some trepidation as to how I would manage to travel so regularly and with relative luxury in my retirement. The prices of hotels seems to be rising and rising and paying by the night means that long term such as three to six month (or 182 day) vacations are very expensive indeed. Now I have discovered how to gain the sought after long vacations without spending all of those hard earned retirement monies. I generally exchange houses and cars so I have transport available too. I have swapped houses all over the world. Usually with baby boomers like myself but also with much younger people who have a great sense of adventure. Oh how I wish I had discovered this when I was younger it would have opened up so many more vacation doors to me or at least it would have made my many and varied vacations much more affordable! I have undertaken numerous house exchanges throughout Europe, USA, Canada, New Zealand and Australia. As an example of my globetrotting, this year I have had luxury exchanges within Australia, one to a beautiful home in Adelaide on the ocean front where I watched as dolphins frolicked by; another to a large home on the Sunshine Coast near Noosa with magnificent grounds including a tennis court and a swimming pool. Around Easter time I exchanged with a home in Los Angeles, USA, nestled in the Hollywood hills, then mid year I spent two months in a series of different homes around Bonnie Scotland, taking in the history of the areas as well as the magnificent scenery there. I also undertook a short home exchange to Iceland when I was in that part of the world. More recently I have exchanged with a rural property in New Zealand South Island and enjoyed all that the rich agricultural area has to offer. The purpose of most trips was vacation, however some were trips where the “old me” would have booked hotel accommodation to specifically attend events. In Adelaide I had some work to undertake; on the Sunshine Coast I had a family birthday party to attend; in Los Angeles I had family duties to attend to; and I wanted to attend a special party in New Zealand. Instead of cramming into expensive hotel rooms and spending on car hire, I had entire homes at my disposal and free cars to use! This is NOT Airbnb or Stayz or any type of scheme where money changes hands. Absolutely NO MONEY changes hands, all that happens is that I agree to swap houses with you, simple as that. I will explain a lot more over the next few weeks.